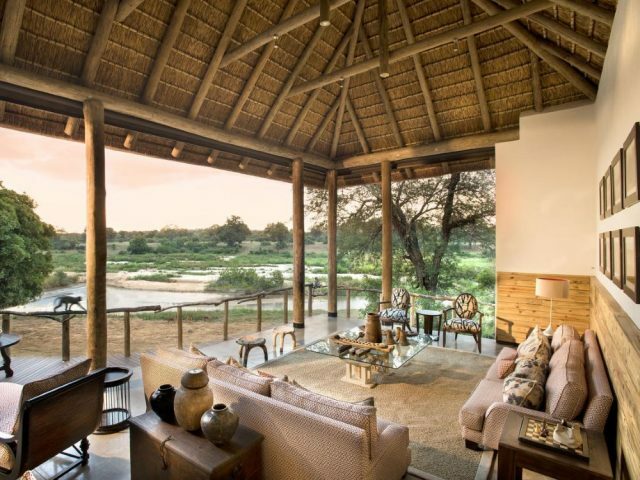 Great game viewing pretty much guaranteed – this is one of THE prime game viewing areas in Africa! 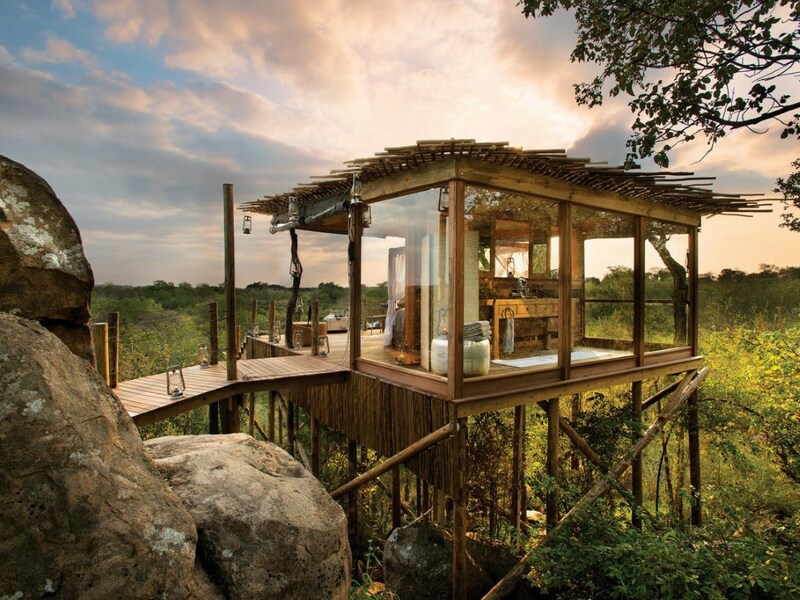 If possible spoil yourself with a night under the stars in the stunning Chalkley Treehouse! Not cheap – then again, can you really expect a great experience like this to be light on the wallet? a highlight are the private wooden viewing decks overlooking the Sabie river where you can lounge about with a good book in hammock chairs with just the sounds of hippos snorting in the river to keep you from nodding off! Whilst there are a huge number of game lodges that are positioned on river banks, the vast majority of them look out over “sand rivers”, small perennial rivers that only flow at times of heavy rain. That’s what makes Lion Sands River Lodge so special as it looks out over the majestic Sabie River, one of the few rivers flowing through the greater Kruger Park area which has water all year round. To us there’s little that can better the wonderfully relaxing sight of flowing water which always seems to have a hugely therapeutic effect on the soul! Of course it’s also a huge attraction to the animals which are attracted by the sweet waters and which tend to congregate around this reliable water source, particularly in the drier winter months when much of the surface water in the bush dries up – the result is that game viewing is consistently excellent all year round! Nestled under a canopy of trees dating back almost 800 years, Lion Sands lies at the southern border of the famed Sabi-Sands reserve on a concession of 4 000 hectares and the lodge enjoys spectacular views over the river into the neighbouring Kruger Park (all fences came down years ago) There are actually a collection of lodges here, with the River Lodge being the very attractive “entry-level” offering before you move onto the even more luxurious (and expensive) Ivory Lodge as well as the exclusive use 1933 Lodge. The whole operation is family-owned and managed by the 4th generation More Family - where the highest standard of guest service and experience have been handed down from generation to generation. Their grandfather, who had a passion for the bush and was a keen hunter, stumbled across this piece of land and was stopped in his tracks the first time he saw it almost a century ago. He was one of the founding members of the Sabi Sand Wildtuin in 1948 introducing a long history of community and conservation. 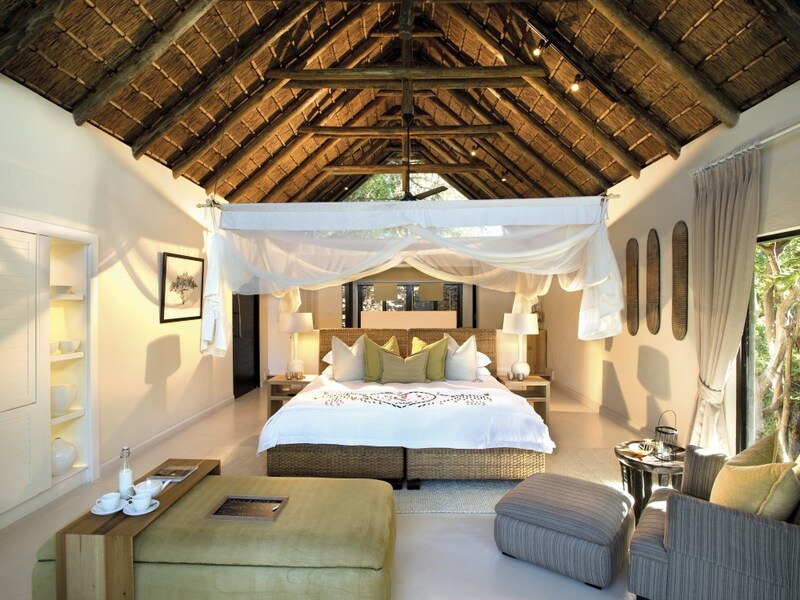 Lion Sands River lodge is made up of 20 thatched suites - 12 Luxury Suites and 8 Superior Luxury Suites. The main difference between the 2 room types is that the Superior Luxury’s are larger (98 m2 versus the 66 m2 of the Luxury’s) and they also boast wonderful outdoor showers not enjoyed by the smaller rooms. Whichever room type you choose you’ll delight in the contemporary styling with classy cream and beige décor and stunning en-suite bathrooms with free-standing tubs and amazing rainfall showers! Bedrooms are of course air-conditioned and also come equipped with over-head fans to give extra relief from the smouldering summers. A highlight are the private wooden viewing decks overlooking the Sabie river where you can lounge about with a good book in hammock chairs with just the sounds of hippos snorting in the river to keep you from nodding off! River Lodge offers a wealth of activities for you to enjoy – so much so that making a choice can become a problem! There are bush walks, bird watching, hippo walks, clay pigeon shooting, astronomy, wildlife lectures, local village experiences and the famous bush meals (and the 2 game drives a day of course!). For those of you who enjoy a bit of bush-style pampering (which we all do let’s face it!) there’s a lovely Spa "Lalamuka" which means unwind in Shangaan - and that’s exactly the result you can expect from one of their massages. For those early risers there is yoga at sunrise on the deck where you can stretch whilst enjoying being chorused by a multitude of birds! The rooms are linked to the public areas by raised wooden walkways and there’s a lovely lounge with a cosy fireplace (for those chilly winter evenings) bar, indoor and open-air dining area, as well as 2 swimming pools – the main swimming pool is one of the best viewing spots with an interrupted view of the river and the bush beyond. There’s also a secluded bird hide for birding enthusiasts. But the main drawcard of Lion Sands is that it is quite simply one of the finest safari areas in Africa with one of the highest densities of wildlife around – going out on your twice-daily game drives you’re pretty much guaranteed stunning game viewing. The big game is also well habituated to the presence of game vehicles resulting in up-close-and-personal sightings that will be sure to get your pulse racing! The rangers and trackers are expertly trained to not only provide you with heaps of information on all aspects of what you’re seeing, but are also incredible hosts, passionate about making sure your highest expectations are met. Afterwards you can enjoy delicious meals on the wooden deck and traditional boma dinners in the bush under the African sky. 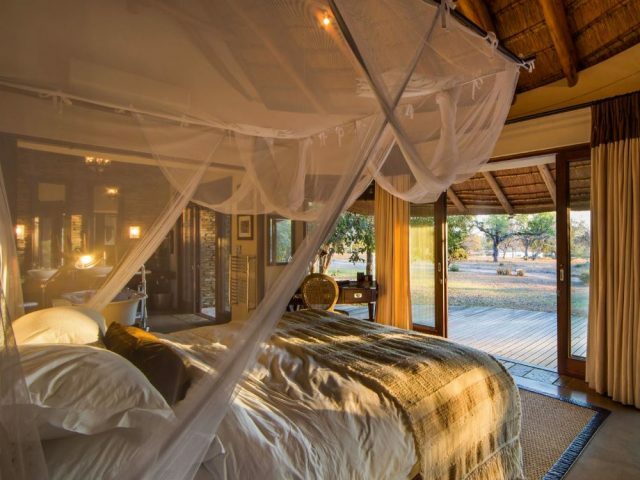 Which brings us neatly to one of Lion Sand’s most special attractions – for the romantic treat of a lifetime why not spoil yourself with a night under the stars in the form of the ultimate bush bedroom: the spectacular Chalkley Treehouse! You’ll be taken to this lavish platform built in an ages-old Leadwood tree at sunset, where drinks and a scrumptious picnic dinner await you before you’ll turn in for slumber beneath the incredible night sky – a guaranteed once-in-a-lifetime experience! A Sabi Sand Gate entrance fee of R 280 per vehicle and R 120 per person is applicable and is payable directly at the Gate. Valid until further notice and subject to change. 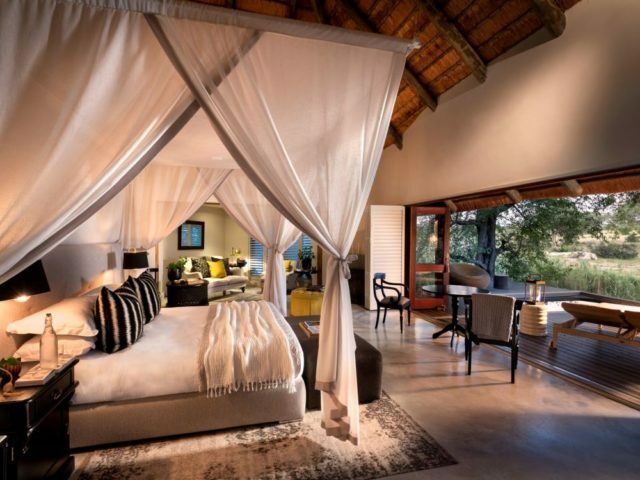 A Conservation Contribution Fee of R 138 per person per night will apply to each guest booked into Lion Sands Private Game Reserve.